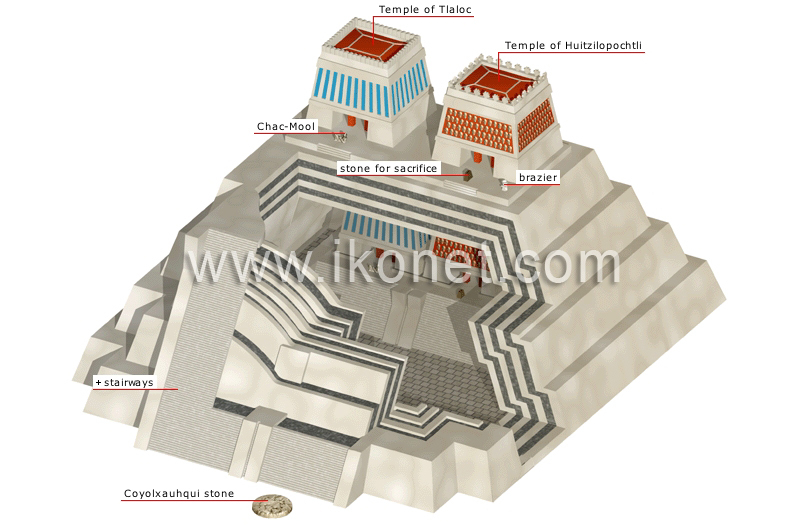 Pyramid-shaped religious edifice of pre-Columbian Mexico featuring one or several temples. Series of steps leading to the summit of the pyramid. Sculpture representing a reclining god. Temple devoted to the god of rain, lightning and fertility. Receptacle in which the heart of the person sacrificed was burned. Block of stone sculpted in the image of the Moon goddess, sister of Huitzilopochtli. Alter on which human sacrifices were performed. Temple devoted to the Aztec god of the Sun and of war.